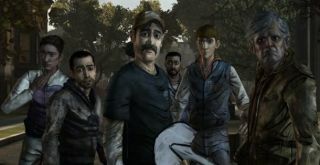 Things are coming to a rotting, maggot-infested head in The Walking Dead: Episode Four, as evidenced by this pre-launch trailer featuring an inebriated and slightly unhinged Kenny (whoa), a hospital of voyeurism (ugh), and Clem's increasingly endangered survival (RAAARGH). Telltale's fresh descent into apocalyptic madness releases sometime this month, and it can't come fast enough. I'll while away the minutes staring listlessly at this Lee and Clem portrait which abruptly appeared in our office like a frozen moment of zombie-slaying bonding.